"Team Ebola" physicians Jay Varkey and Colleen Kraft; Sharon Vanairsdale, SCDU program director; Bruce Ribner, physician and SCDU medical director; Barb Ribner, his wife; Sonia Bell, SCDU program coordinator; and Marshall Lyon, physician. 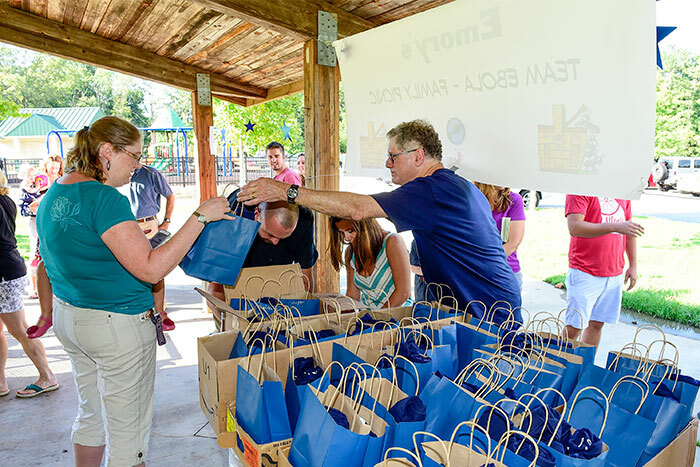 Bruce Ribner, medical director of the SCDU, hands out "Team Ebola" t-shirts to staff and family members at the picnic. Bruce Ribner, medical director of the SCDU, thanks family members of the "Team Ebola" staff for their support and dedication during the months the staff cared for four patients diagnosed with Ebola virus disease. 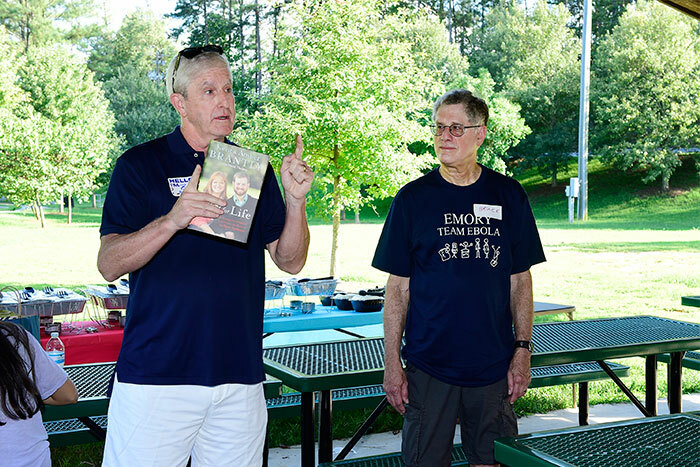 Bob Bachman (left), former Emory University Hospital CEO, thanks staff and families for their hard work and support, while Bruce Ribner looks on. Bachman also passed out copies of patient Kent Brantly’s autobiography, entitled "Called for Life." 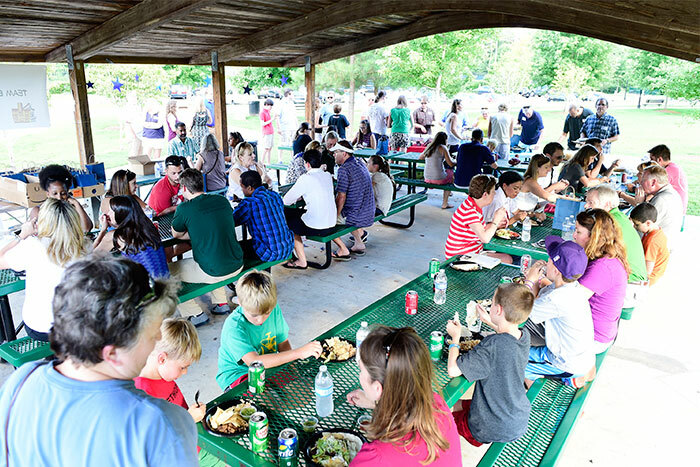 At the "Team Ebola" Family Picnic, staff and their family members enjoy a Mexican feast. 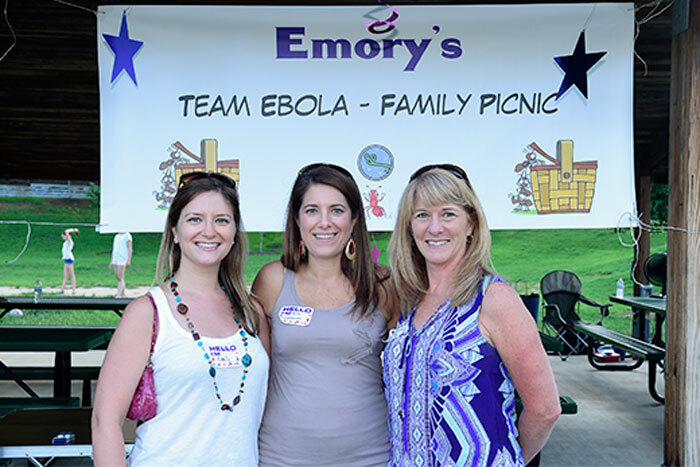 Dozens of Emory employees and their families came out to Mason Mill Park on Aug. 23 for the "Team Ebola" Family Picnic. The cake says it all! 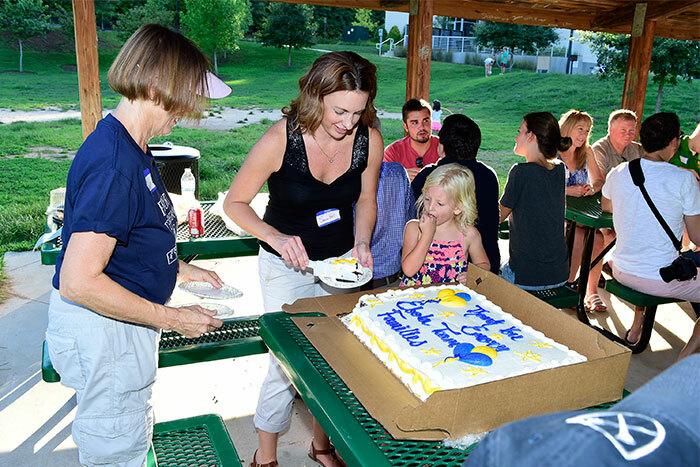 Barb Ribner (left), Bruce Ribner's wife, and Sonia Bell, program coordinator for the SCDU, cut and serve the "thank you" cake. 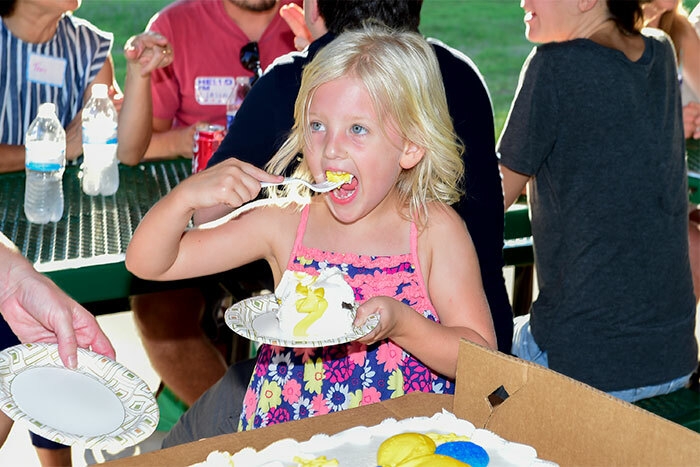 Sophia Bell, 5, daughter of Sonia Bell, program coordinator for the Serious Communicable Diseases Unit, says bring on the dessert! From left to right, nurses Emily Beck, Kim German and Susan Bailey from Occupational Injury Management. 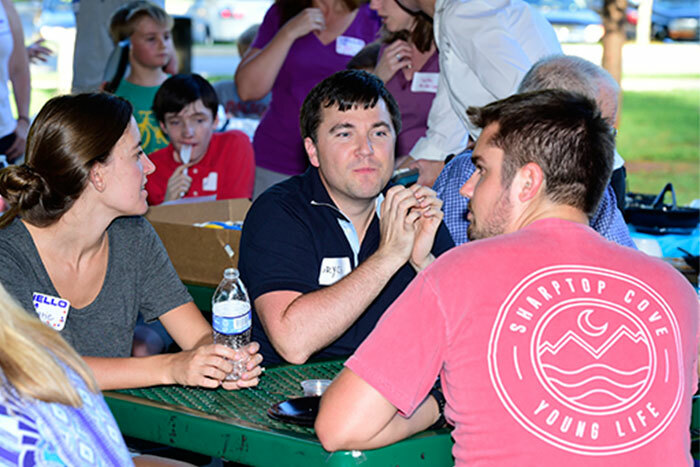 Nurses Bryce Barnes (middle) and Jason Slabach (right), along with Jason’s wife, Katie (left), take a moment to relax at the picnic. 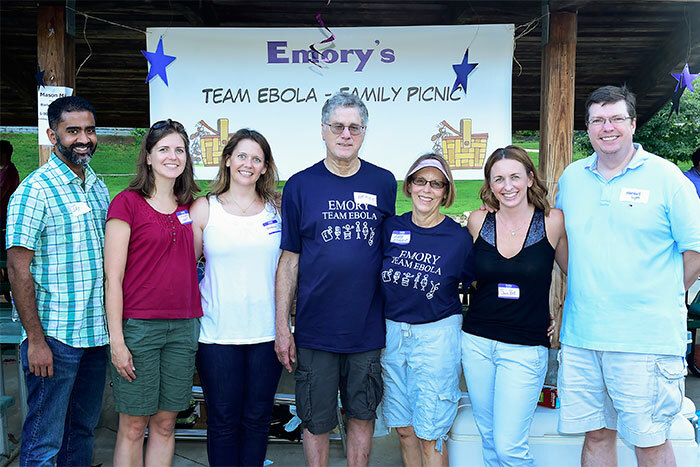 The "Team Ebola" Family Picnic, held Aug. 23 at Mason Mill Park, was created to thank family members of Emory University Hospital employees for their support while their loved ones cared for patients with Ebola virus disease. Photos by Jack Kearse. 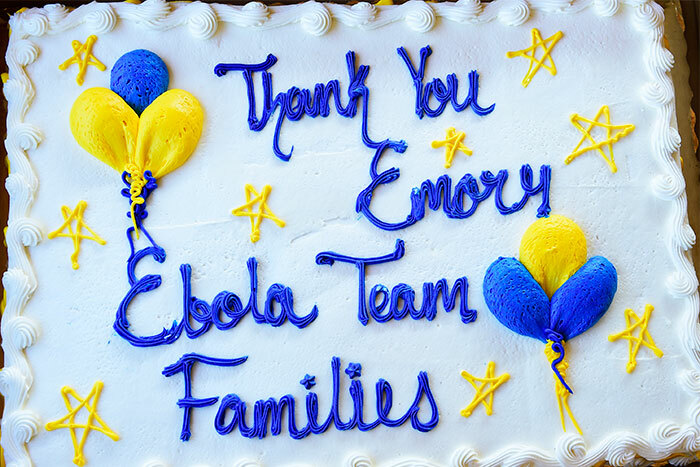 A year after the first two patients infected with the Ebola virus left Emory University Hospital disease free, members of Emory’s Serious Communicable Diseases Unit (SCDU), where the patients were treated, held a picnic to say thanks. The gratitude went out to family members of the Emory employees. They were recognized for their support while members of “Team Ebola” worked countless hours and multiple shifts last year caring for patients diagnosed with Ebola virus disease. 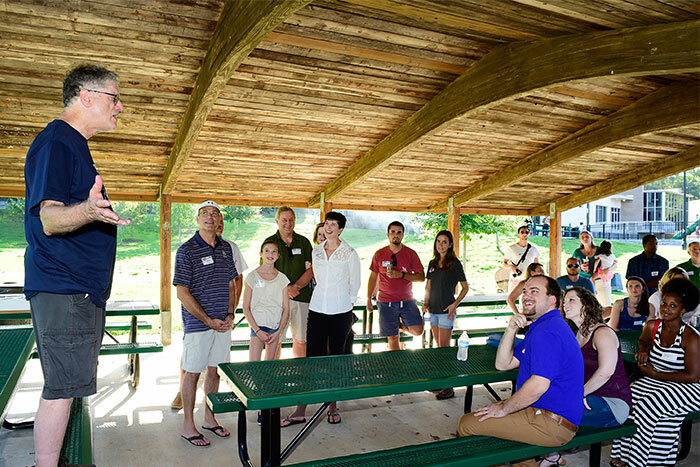 Doctors, nurses, lab technicians, environmental health and safety members, administrators and more brought their loved ones to Mason Mill Park on Sunday, Aug. 23, for the celebration. Everyone dined on Mexican food followed by a large “thank you” cake, while introducing family members to colleagues. Finally, faces could be put with names from the many stories that had been told and heard. “This gathering is for the family members of our staff who adapted to us being away from home for hours and even days at a time, supporting us and cheering us on for the work we were doing to care for our four patients diagnosed with Ebola virus disease,” says Bruce Ribner, MD, professor of infectious diseases and medical director of the Serious Communicable Disease Unit at Emory University Hospital. Emory was thrust into the international spotlight when Kent Brantly, a doctor serving as a medical missionary in Liberia, was admitted to Emory University Hospital on Aug. 2, 2014, becoming the first person with Ebola virus disease treated in the United States. Nancy Writebol, also a missionary in Liberia, who was admitted Aug. 5, 2014, and quietly discharged, according to her wishes, on Aug. 19. Ribner and a team of specially trained nurses, physicians, lab technicians, facilities management staff, environmental safety staff and many others had been preparing for more than 12 years to receive and treat patients with serious communicable diseases. The SCDU, a special isolation unit established in 2002 with assistance and funding from the CDC, was originally designed to care for CDC scientists and staff who contracted highly communicable diseases in laboratory settings or while traveling abroad. Quarterly trainings are held with team members to keep everyone up to speed on procedures and protocols. 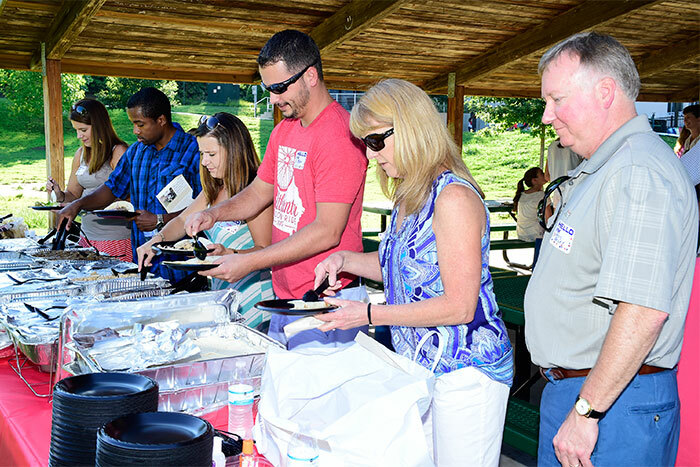 And while those trainings continue now with a larger staff and more employees wishing to be a part of the effort, the “Team Ebola” picnic was a reminder of just how important family is when challenges arrive, big or small.